Our last day here in Rome was filled to the brim with activity. We started the day back in Trastevere where we had dinner last night to explore a bit more before walking to Vatican City. We dodged the rain by stopping in a cafe for an aranchini and some pizza margherita on the way. 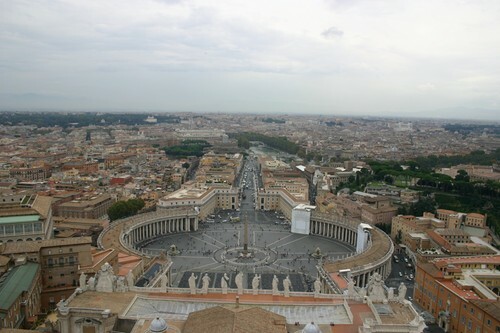 Once in the Catholic Holy Land, we toured the Basilica before Wes convinced me to walk all the way up to the top of the dome. There were like 9,000 steps, I wanted to die. It was pretty from the top though and Wes did get some amazing photographs. We were exhausted after that but we had to go to the Vatican museums to see the celling of the Sistine Chapel. After all the stairs and all the touring in the museums Wes rewarded us with a cab ride home. My feet were very grateful. We hung around at home until dinner time (it's later here than at home, restaurants here don't even open up until 8:00) and then headed back into town for our goodbye meal. We had carbonara and cacio de pepe with bruschetta and Prosecco. We then journeyed back to our favorite Gelato place (the only one we ever went to twice) for a goodbye gelato. We are so sad to be leaving, Rome has been very good to us and we promise to be back.